October 01, 1974, Kenneth Tidwell. 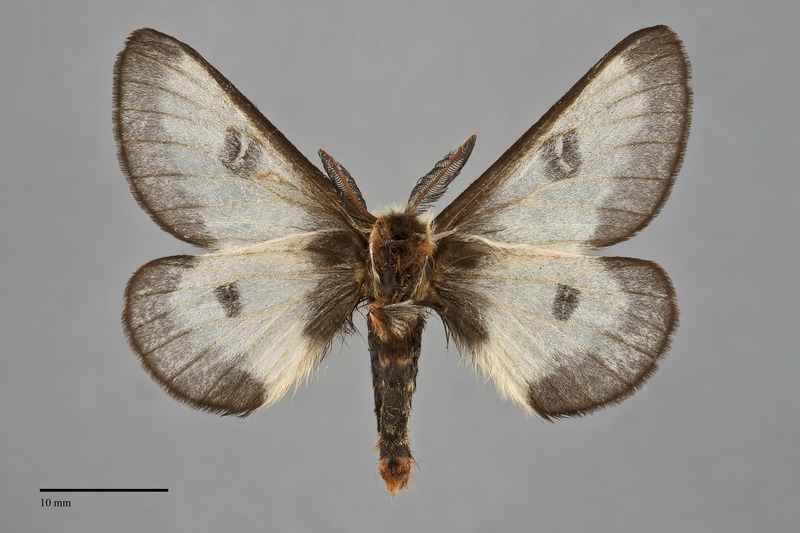 Hemileuca nevadensis is a large to very large diurnal moth (FW length 25–35 mm; wingspan 5.0–6.5 cm) with black and white wings that flies in desert wetlands during the fall. The forewings and hindwings are similar, translucent creamy white with black bases and margins. The costa is also black. The large discal spots are black with bar-like pale white to yellow centers. The collar and tegulae are usually cream, but the latter can be black. The abdomen color is sexually dimorphic. Those of females are completely black whereas the male has a black abdomen with and orange-red tip. The antennae are bipectinate, much wider in males than in females. This species is unlikely to be confused with other species in the Pacific Northwest. Hemileuca juno, previously reported from southern Idaho in our area, is also black and white but its hindwing is completely black. 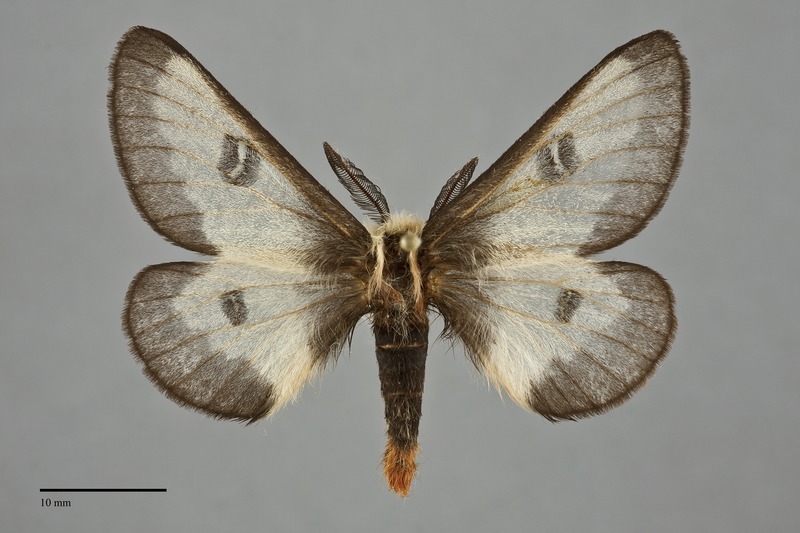 The relationship of Hemileuca nevadensis to the eastern moth Hemileuca maia is an interesting taxonomic problem. Once thought to be clearly distinct, with H. nevadensis feeding on willows (Salix spp.) in western wetlands and H. maia on oaks (Quercus spp.) in eastern upland habitats, the relationship has become muddled since the discovery of buckbean-feeding (Menyanthes trifoliata) wetland populations near the Great Lakes. The body is pale yellow and black with black and white branched spines (which can deliver a sting if handled) as well as golden yellow whorls of hairs on the dorsum. The prolegs are red. It is illustrated by Tuskes et al. (1996). This species may be widely distributed in wet lowland riparian habitats along creeks and rivers of the sagebrush steppe regions at low elevations east of the Cascades, but is rarely collected because of its very late flight season. Hemileuca nevadensis is found along the Columbia River in the Columbia Basin, with the most northern record near George, Washington. It also occurs along the Snake River near the Idaho-Oregon border. It may be more widespread but has gone undetected due to its late fall flight period. Distributed across most of the western and northern plains states from southeastern Washington, Saskatchewan, and southern Manitoba south to southern California, central Arizona, and central Texas. As noted above, the eastern limits are poorly defined due to hybridization or intergradation with H. maia. The eggs are layed in rings around twigs of larval host plants. They overwinter and the larvae emerge in the spring. This species appears to be a foodplant specialist on Salicaceae including both willows (Salix spp.) and cottonwoods (Populus spp.). Young larvae feed in groups where as older larvae are solitary. The cocoons are spun loosely in leaf litter under the host plants. Hemileuca nevadensis adults emerge in September and October. It is a very active day flier with males actively searching for calling females. Occasionally, large outbreaks of caterpillars can defoliate large patches of cottonwood and poplar trees.